I am a big fan of Kelli Jae Baeli’s writing and this book is no exception. 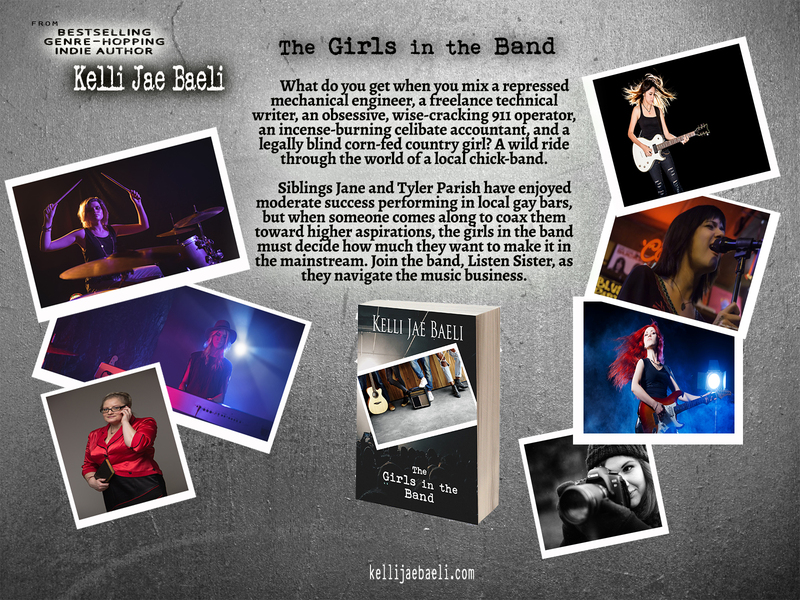 She delivers a solid characterization of several members of an all girl band, detailing their hopes, fears, struggles, their lives prior to the band, their relationships, and their future as bandmates. Each band member as well as their manager is well developed and add something to the story. Ever present is Baeli’s trademark sense of humor with several parts of the book displaying laugh out loud witticism. So, what’s it like to be in a band? Click Buy Now and jump into these pages for a trip into the rock’n roll lifestyle we all wish we could experience for ourselves. This goofy crew of lesbian rockers led by Jane and narrated through her sarcastic/judgey point of view are a lovable mishmash of unique personalities and habits that miraculously gel together to form a talented band with promise. Their screwball adventures will have your belly aching from uproarious laughter, but are tempered from time to time by solemn moments when the going gets tough. These girls won’t quit on each other no matter how bad it gets, and it’s not too long before the jokes and pranks are business as usual again. It’s this kind of life filled with fun, laughter, tears, and music that makes you want to high-five and fist-bump your band mates while being part of something special. It was pure fun riding along with the band. Freebird!!! Really, really good! I never realized so much went on with a band but can surely understand how they all feel like family. Jane and Tyler had a lot to overcome in their young lives and Franki (who was my favorite) battled her own demons. However, with the help of the band’s “fairy godmother”, Courtney, they were able to achieve what they all wanted. All the ladies personalities were very well defined. The author has such a way with words that the reader feels a real affinity to the characters. This story is proof positive that thru hard work and determination great things can be achieved. This is one that will leave you cross eyed, because, you just won’t be able to put it down until the end. I literally felt the heart and soul of each one of these character’s, Their struggles with coming to terms with their life experiences, through the music, and the bonds they shared with each other. I don’t want to give anything away but in the end, I couldn’t stop smiling. My admiration for this Author just tripled. I loved The Girls in The Band. Great story. I love the feeling that I’m sitting in an old overstuffed arm chair listening in on my sister and band mates. The book really draws the reader into the story. "You're only responsible for being honest, not for someone else's reaction to your honesty."